Gin is tried. Tired of the killing. Tired of the fighting. Tired of trying to survive. And when one of her employees finds herself in a whole lot of trouble in the crosshairs of one of the more dangerous crime lords in the city, she has to wonder just how far this is her duty to fix? But Bria is also deeply involved and Gin can never abandon family. Even when that family is being reckless, foolish and perhaps more dedicated than she should be. Which we did. 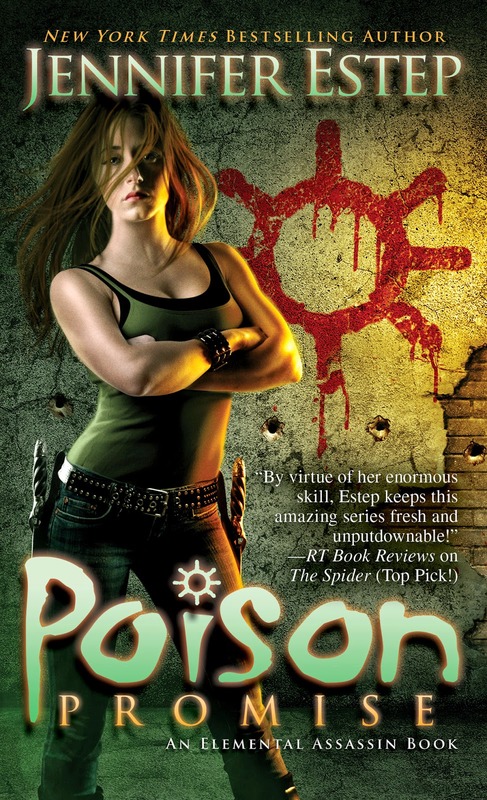 But Heart of Venom was book 5, Poison Promise is book 11. That’s an awful long time to transition. The other books did everything I said – but in general the series was beginning to falter and become boring – as I mentioned in my review of The Spider. Yes, we seem to have turned a corner on several issues. Firstly, and most obviously, is the new big bad coming to town. I am a little leery because the new big bad, as introduced, feels far too much like the last big bad. I know that makes for great symbolism, but I also hope there isn’t going to be too much rehashing. The second major change is Gin’s own attitude and awareness. There was a lot more focus on not just Bria but on the conditions of Southtown. Southtown is desperately poor with virtually no opportunities that are not crime related – the only people we know who have managed to escape life in Southtown have resorted to dangerous or criminal enterprise (or both) to do so. It’s their only option. The police have given up on the area, the crime boss openly rules the area and it’s all very grim. I particularly like how we’re repeatedly forced to see the grey in all the characters – like it would be easy to see Troy as an abusive drug dealer or Coral as an addicted kidnapper – but both were forced by desperate circumstances into the lives they lead. Both did terrible things, both faced terrible consequences if they failed to do those terrible things. This was their lives in Southtown, a place with no options. It’s a really good class analysis. And for much of the series this has been seen and accepted. Some got out (like Rosalyn and Catalina) but most didn’t and the characters – and Gin – accepted this as something they couldn’t change. This has an interesting parallel with how Gin has dealt with the constant attacks by various crime bosses trying to prove themselves. She has accepted this with the same fatalism, she has to fight them, she has to save herself, and then move on. Her daily life now includes fighting for her life. She can’t change this. Gin starts the book very worn down. Tired. Tired of killing. Tired of the pro-bono work constantly dragging her into life or death situations. Tired of always been on guard. Tired of the endless fighting and blood and just wanting it all to end – even if a devil’s bargain may be needed. By the end of the book this all develops extremely well with some truly excellent character growth – but also bounces off Bria. Now, the conflict between Gin and Bria (Bria law & order vs Gin’s assassin) annoyed me because I thought we had resolved this already – it’s bad enough to have filler books without rehashing the issues they put to sleep! But this really showed up a lot of Bria’s personality, her determination, her drive, her need to make things better, to protect those around her all of which mirror Gin so closely – albeit using different methods. The whole interaction was excellent exposing so many issues – Gin treating Bria as less capable, Bria proving herself, Bria having to confront just how unrealistic her lines are and what they cost, Bria weighing people against values and through all this Gin finding a new way to relate to the world and her role in it. The character development is good – and with it we should see a new ramping up of the whole series. Other improvements I liked – while there was a standard “Gin gets captured/brought low” we managed to pull back on at least some of the inevitable torture she always seems to face. It seems to be an Elemental Assassins trope: Gin attacks enemy, Gin lose, Gin is tormented most horribly, Gin gets out, Gin stabs everyone until they stop twitching them stabs them some more. With some extra stabbing. Stab stab stab. On that note, I also appreciated that while there was still plenty of stab stab stab, Gin has, again, remembered she’s the super powerful Elemental and actually using her power. Yes, overpowered protagonists can be annoying but Gin is surrounded with bad guys with super duper powers and she matches them but never uses it – I love this new direction of Gin using all her resources. This book also had the series’ first LGBT character. Honestly, while this is good, I’m also disinclined to offer praise for finally introducing an LGBT character in book 11. There’s an awful lot of “late” in that “better late than never.” The character himself isn’t stereotyped – in fact, he’s tough, dangerous and generally not conforming to personality tropes. But I’m also basing him being gay or bisexual on one line in the entire book (though I don’t think it was ambiguous). I’m tip-toeing around his identity because it would be a spoiler, but my main problem with this character is that his life revolves around his niece. He even throws away his work, his loyalty, risks his life and is brutally tortured, all for his niece – there’s a reason why we have a trope called The Gay Uncle. And he ends up in a less-than-ideal role with Gin. I am hopeful to see more of him since he has been set up to be something of a regular – but I also want to see him be more than what we’ve seen. This character (behold my spoiler dancing) is also Latino. As is Catalina. Roslyn and Xavier are both Black and one of Gin’s circle of friends is Native American. I don’t think they’re the most dominant characters in Gin’s life (Bria, Finn, Owen and, to a lesser extent, Sophia takes those spots) but they are consistently there.